My favorite news article from the BiH press was the one that detailed how the new City Hall in Mostar, despite being open, was not ready to serve as a venue for weddings due to unresolved decisions about fees and so on. No one would agree on simple tigns like chairs, either. 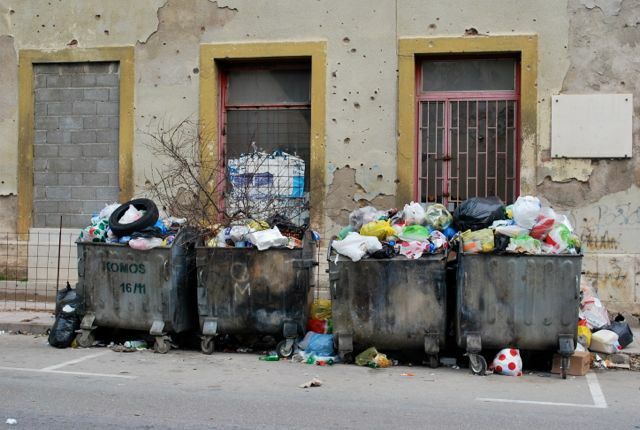 For the past 10 days or so, the garbage has been piling up here on the east side of Mostar. ( Everyone uses the communal dumpsters that are placed in the various neighborhoods. I use the one just down the street from the children’s hospital.) I was told that the garbage collectors for the east side haven’t been paid for four months. Despite Mostar being one city, public services are divided and administrated differently. ( The faculty at the university on the east side also experienced significant delays in receiving their salaries.) So, on the west side, the garbage has been collected as usual. It is January, and unusually warm, but not so warm that the garbage is stinking. But it is raining hard, and the water is now dirty as it floods though the stacks of bags sitting on the ground next to the dumpsters. Still, there is not as much garbage as I might see in the states. There is little waste here, although I do see people throw away clothes and shoes. I also see Roma men carefully searching the dumpsters for bottles, metal, and other scrap. I have seen Roma children drag broken toys out of dumpsters. And the many feral cats survive gleaning through people’s garbage. Many people leave bags of stale bread tied to the handle of these dumpster for people to give to livestock. Or I suppose, some people eat this bread. BiH is a poor country. The average monthly salary is reported to be just about 575$. This might serve an entire family. while food is relatively cheap, other goods are not. Clothing is expensive, and so is gas. Cigarettes are less than 2$ a pack. A coffe might be 1$ or less. When I go to the mall to window shop, I see many people but no one is buying much. Many go to sit over coffee and cigarettes for hours. Even a movie ticket, just a few dollars, is beyond many. MacDonalds is relatively expensive treat. Of course, the average salary means a few make much more, which was the subject of television and news reports for a brief time. This strike, though, and related protest on the East Side about the parking entity, is the first I have seen of populist anger and frustration. You can imagine that if you barely make ends meet, then no pay for a few months is a serious thing. There will be elections in October in BiH now that they have finally agreed on some technical issues related to these elections. And I read that some are hoping that corrupt officials will be replaced. I was also told that students will strike to ask for a second exam term in October due to the disruption of the elections on their exam schedule. It will be interesting to follow, even if I will be thousands of miles away. The status of this city and this country will forever be a part of my life. This entry was posted in Uncategorized and tagged BiH, elections, garbage, salary, strikes. Bookmark the permalink.